Some people who survive a life or death event — like war, sexual assault, or a plane accident — get mired, reliving trauma for decades, experiencing the intense anxiety, depression, vigilance, flashbacks, and nightmares characteristic of PTSD. For these people, memories remain vivid and feel horribly alive until a therapeutic intervention, such as EMDR, softens them. For others, who have been through the same types of dangerous events, memories of the trauma transform apace into manageable life lessons, without professional intervention. The difference is in large part determined by the social resources available in the aftermath of trauma. If you have people around who help you process the thoughts and emotions aroused by trauma, you are much more likely to recover. If, however, you struggle alone with your memories, and the conclusions about yourself that follow, (like, “It was all my fault,” or “I’m still in danger,” or “Something’s wrong with me), the memories stay stuck in their original form, inspiring fight/flight/freeze responses to triggers of the original event. 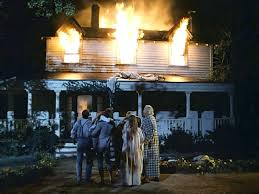 I’m reminded of the episode of the 1970s TV series The Waltons where the family’s house burns down. In case you don’t know the show, I’ll recap using my very faulty memory of watching it forty years ago. One night in Depression-era Virginia, John Boy Walton leaves his lit pipe on a table in the hallway. That same night Grandpa Walton leaves the electric heater running in the bathroom. The next day both artifacts are discovered in the smoking embers. But was it John Boy’s pipe or Grandpa’s heater responsible for the disaster? In Every Moment of a Fall, Carol’s memoir of recovery from trauma using EMDR, we watch in agony as her parents miss one opportunity after another to challenge her self-blame. Like John Boy with his pipe, Carol takes responsibility for the crash that killed her sister. Then, because there is no Grandpa Walton in her story, (not in her immediate family, nor, when she becomes an adult, in her primary relationships), she remains stuck. That is, until her therapists Connie and Jan arrive. Connie, with acceptance and gentle prodding, starts challenging her life’s narrative. Jan, with EMDR, facilitates a radical re-examination of the facts. When the work is done, instead of believing the accident is all her fault, she sees it as nobody’s. From this vantage she gets curious about why her dad let her take the blame in the first place, why her mom went along, and why the other men in her life had followed suit. And that, as the poet wrote, has made all the difference. Andy Weisskoff, LCSW, is a psychotherapist and EMDR specialist. Learn more about EMDR and his practice at AndyWeisskoff.com.